In fibreQUARTERLY volume 3 issue 1 winter 2007 we looked at "makers" in the IDS07 (Interior Design Show ) OFFSPRING - INSPIRED BY NATURE, Studio North. Bookhou Design which was co-founded by John Booth and Arounna Khounnoraj in 2003 and now in 2015 is an established name in the Canadian Design world. This is Lilly Yung's "Tendril ", Laser cut drapery panels [photo provided by Lilly Yung] Yung was a designer/ innovator on the cutting edge of new digital design and fabrication technology in the early half of the first decade of this new century. A well respected and admired designer Dr Lily Li Li Yung born April 18, 1947 passed way on August 11, 2010 and her lose is still felt as is the influence she had on the contemporary Craft community. Craft Ontario set up the "The Lily Yung Memorial Award" which has been awarded yearly since 2011. 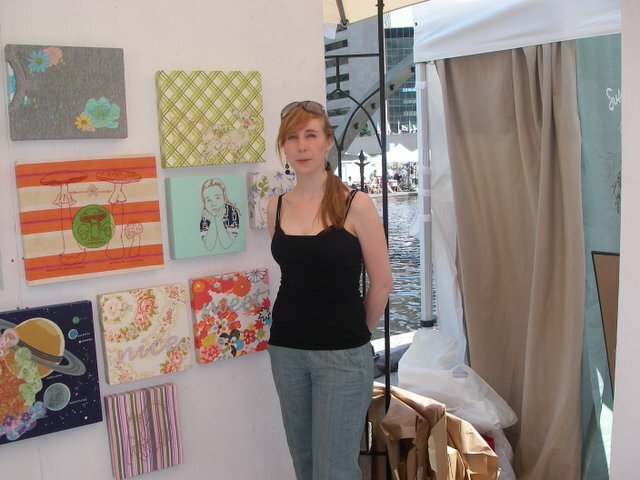 This is Andrea Vander Kooij photographed at the 2006 TOAE (Toronto Outdoor Art Exhibition) she had been profiled in one of the last issues of Surfacing the magazine published by the Textile Artist Designer Association (1972-2005). I had been volunteering for them doing their E-newsletter and it was their shutting down that led to me starting fibreQUARTERLY as a temporary stop gap until another national organization/ association promoting the work of and looking out for the interest of and the Canadian textile and fibre community was created. that has not come to pass. In 2006 I had fibreQUARTERLY the online magazine on the go along with fQaroundtown Blog which was created to bring timely information about shows conferences in a more timely fashion between issues. Then the internet changed and while many artist had websites and had started Blogging Suddenly Facebook, twitter and Social Networking arrived and the "Gloves where off" so to speak. Fibreworks 2008 was the occasion for which I published my first of what became my Facebook Textile Sighting albums. Canadain Ross Bonfanti 's mixed media [petrified and thread bare] teddy bears sitting on Austrialin David Bromley ' s Boxes [Printed Linen Mounted on Board] hearken back to childhood. better times. this photo was taken with verbal permission and I had my press pass. Both of these artist where represented by the Rebecca Hossack Art Gallery London England who has been bring a number of “Fibre” artist to the Art Toronto yearly and fibreQUARTERLY has used both the fQaroundtown Blog and facebook Textile Sightings Albums. By 2008 I had earn my press credentials as a critic not “blogger” and with or with a press pass I have tried to ask permission to take photographs. I have become more aware of the importance of naming the artist, the gallery, the event and provide the links to each with in the description of the image. With the ability to Like Comment Share and Pin individual photograph keeping that vital necessary information attached to these postings/ usage. This becomes more difficult when respect for or understanding of the legalities of copyright while very specific are misunderstood, assumed and then ignored anyway. Since I am publishing my photographs the copyright is mine when the pres pass issued by the event organizers makes implicit unless informed otherwise or the gallery management, curator and /or artist has given me permission. (getting that from all three is really good and if I have not received it from the artist I will try to communicate with them before I post/ use it. Disseminating images without information is rather pointless and devalues the work I am trying to promote through fibreQUARTERLY. SLIPPER CHAIR MADE BY JANET MACKENZIE, C. 1840-60, City of Toronto Culture, 1960.1552.10B, MacKenzie House Museum on 82 Bond Street, taken by Joe Lewis with permission from Mackenzie House Staff for fQ use. Slipper Chair: Lady's chair, with carved and gilt top and side rails, ogee legs, upholstered in polychrome needlepoint, showing a palm tree and tropical foliage. Empire style. c. 1840 - 1860. Measurements: seat: 20" x 20"; top of back: 27"; overall height: 37"
Seat has velvet fringe. Wooden gilt frame with carved design on top of back. Back in green velvet. 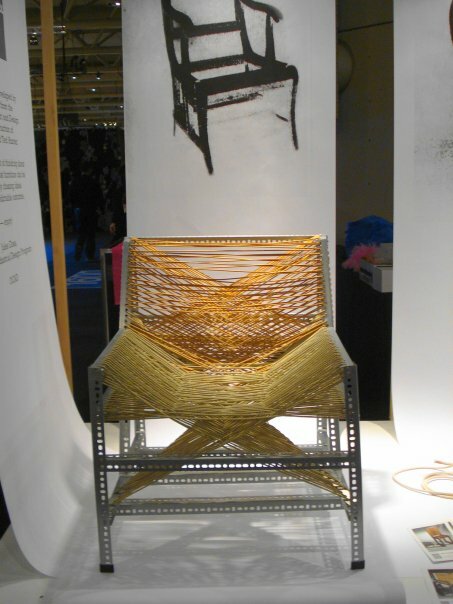 This metal and cord chair "XY "by Haniyeh Khosravi Fard OCAD University) is made of simple metal shelving parts and two colours of cord. I saw it at the IDS 2010 photographed it with permission with Press Pass It was posted in facebook Album Toronto International Design Festival I gave it a try and it is comfortable. I could live with this chair. October 2014 Textile Sightings Politics of Fashion Fashion of Politics, Design Exchange 234 Bay Street September 18-Jan 25 2015, http://www.dx.org/index.cfm?id=47464 Fibreworks 2014 Idea Exchange Cambridge Ontario September 12 - November 2, 2014 http://ideaexchange.org/art/exhibition/fibreworks-2014 Friday October 24 it was Art Toronto.http://arttoronto.ca/ This year the number of galleries is down from last year, most bring safe work, not experimental. There was a lack of textile based work but there was some new people like Kristin Nelson with here woven "legal paper" and Robin Kang's Jacquard work.and the gallery that reps her was pretty cool Tabacaru booth 1108.